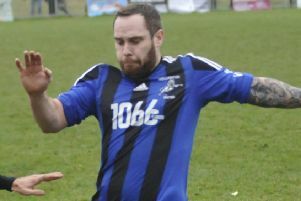 Little Common Football Club’s desperate search for a league victory continues after a 3-0 defeat at Loxwood yesterday (Saturday). The Commoners have now suffered five Southern Combination League Premier Division defeats on the spin, but they remain just above the relegation zone after the two teams below them also lost. Common arrived at Plaistow Road missing Liam Ward and Leon Greig, who were replaced by Adam Smith and Ryan Paul in an otherwise unchanged starting line-up. The Commoners started slowly and were on the back foot from the kick-off, with the hosts forcing a corner in the opening minute of the match. Keen on using their pacey wide players, Loxwood continued to test the visiting defence and were rewarded in the 12th minute. A hooked clearance by the home left-back released Max Miller, who raced through before slotting past advancing Common goalkeeper Matt Cruttwell. The hosts nearly doubled their lead when a free header at the far post was well saved by Cruttwell’s feet. The Commoners then came into the game more. Lewis Hole saw a turn and shot deflect off a Loxwood defender and loop wide of the goal before a superb delivery into the box by Lewis Parsons just evaded Hole’s head. Loxwood almost added a second just before half time when a well-worked move ended with an effort from the edge of the area clipping the outside of the post with Cruttwell beaten. Once again the Commoners made a poor start to the second period, conceding after just four minutes. Miller raced on to another long ball forward before beating Cruttwell with a low shot into the corner of the net. Common tried to rally themselves. Paul saw a header just clear the crossbar before Sam Ellis worked some space on the edge of the area and unleashed an effort which just drifted past the post. The hosts wrapped up the points 10 minutes from time when Cruttwell was unable to deal with a shot from distance and Mark Goldson was on hand to dispatch the rebound. Common went on to to enjoy their best spell of the match, winning a succession of corners before Jamie Crone hit the crossbar with a strike from the edge of the area. Common: Cruttwell, Feakins (Weeks), Parsons, Eldridge, Paul, Alexander, Tate, Smith (Ryan), Hole, Crone, Ellis. Southern Combination League Premier Division bottom six (played-points): 15 Langney Wanderers 34-34 (-27 goal difference), 16 Loxwood 34-30 (-27), 17 Arundel 34-24 (-45), 18 LITTLE COMMON 34-23 (-38), 19 Eastbourne United AFC 33-21 (-47), 20 Shoreham 34-21 (-50).